Residential Styling, Office Styling, Insitutional Styling. During periods when classrooms are not in use, removing valuable computer equipment from plain view on desktops simultaneously reduces risk of accidental damage and theft. 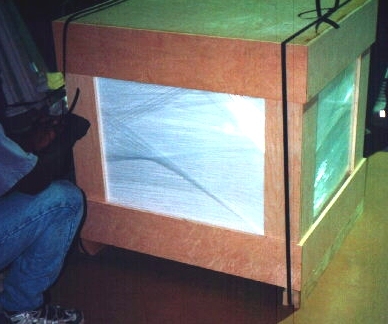 When the sliding desktop is fully extended, the wood or laminate covered sub-shelf is designed to prevent accidental spills into the computer compartment. More importantly, however, when the key is locked with the LS-512 in the down position, (locking the lift mechanism in place), the sub-shelf's primary purpose, is to also help discourage theft access to equipment installed in the compartment below. The security of computer equipment is one of the three highest concerns of institutional purchasers, along with ergonomic adjustability and compact footprint. 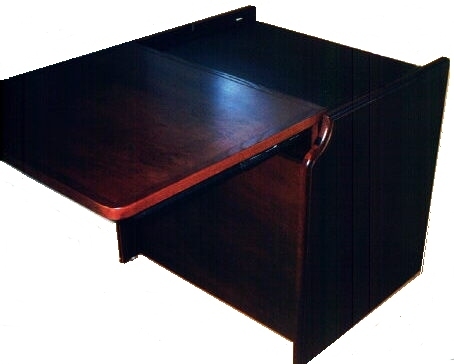 The upper, sliding desktop may also be secured in a non-extended position on this model, with optional top-lok. The desktop is designed to come to the user. 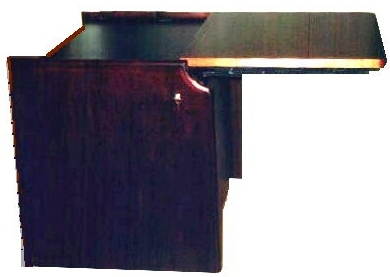 Desktop (and/or keyboard tray) when extended forward as needed, coupled with elevated toespace on front panel, allows this model to provide ample (and comfortable) leg and foot room, regardless of user height. LS-512 fully extended with optional removable drop-in leaf. "Seats Two For Dinner". When leaf is inserted, smoothly integrating with extended desktop, it nests between outer edges to prevent accidental dislodging. 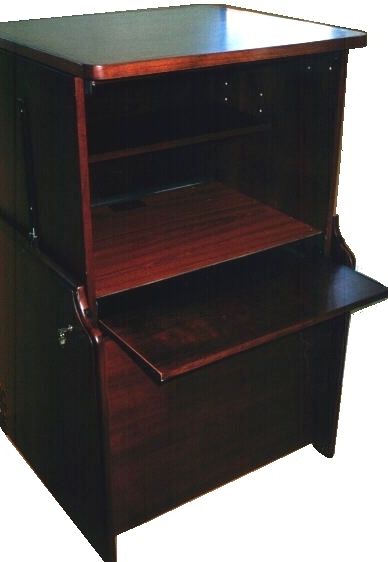 Shown: Cherry Desktop with protective finish to prevent marring during normal use. Using it in a rough-duty environment? Choose laminate! Furniture sliders standard. Casters optional. Choose Furniture Style Models - Compliment Existing Furnishings. 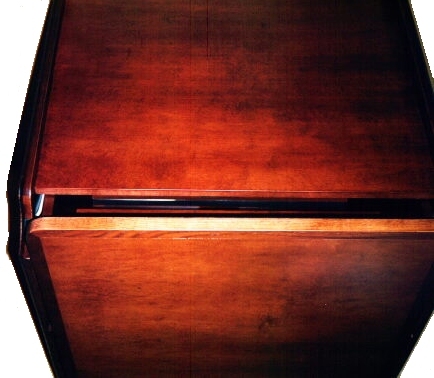 Genuine Country Oak, Washed Oak and Mahogany veneers. Get the pair! This model matches POP-UP TV ! The LS-512 model is designed with airways located below the desktop. The chimney-style method of fenestration for interior cabin air circulation is designed to prevent overheating of computer components, should they be left on while cabin is lowered. Thus, a PC can be charged with automatically uploading or downloading files (without fear of overheating) while the desk is simultaneously being used for other tasks while in the lowered position. Sharing a pizza for lunch, for example. 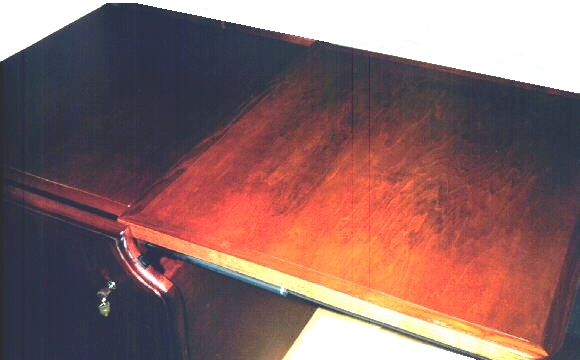 For telecommuting laptop users, the optional height-adjustable half shelf inside the computer cabin, offers a convenient storage area without obstructing or interfering with function or ease of access to printer or other peripheral equipment. A notebook computer may be stowed away on the keyboard tray. Just slide the keyboard tray in, notebook and all. When cabin is lowered and unit is locked, the laptop is both out of site and secure. Particularly practical for dorms, hotel rooms, seminars, airport clubs. 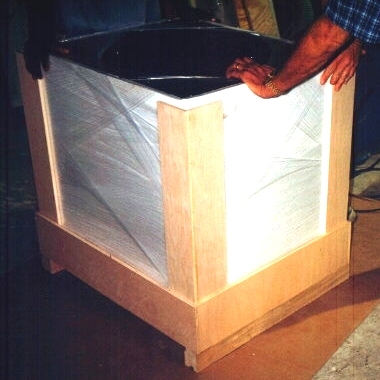 Protective packaging for shipment allows for easy unpacking and packing debris disposal by the end-user. Pallet-jack access, corner protection, wrapped styrofoam and top protection are shown on this factory's solution. Top is tapped into place and packaging is banded through skid grooves. Note: Lighter weight packaging which offers equal protection may be substituted.